Cynthia is a Brisbane north side local. She completed her Bachelor of Dental Science at the University of Queensland in 2008. Cynthia moved to Rockhampton in Central Queensland where she began her work in the public sector at the Base Hospital. In 2010, Cynthia also began working for a private practice in Rockhampton. After two and a half years in Rockhampton, Cynthia moved back to Brisbane. She has continued to practice in both the public and private sectors, in north Brisbane for the past seven years. 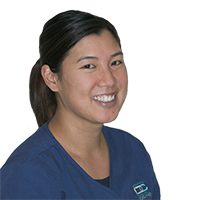 Cynthia enjoys performing all aspects of general dentistry and strongly believes in the prevention and conservative management of oral diseases. Cynthia takes pride in her patient’s experiences. It is her main priority for patients to have positive experiences, especially for those who are particularly anxious, young or just young at heart. Cynthia is also dedicated to continual professional learning so she can provide the best level of oral health care possible. Outside of dentistry, Cynthia enjoys an active lifestyle and is a proud member of several social sport teams and a gym. She also enjoys travelling and is an avid foodie.